If you or a loved one are struggling with aging, and all the cognitive and physical challenges it brings, music therapy might be a great addition to your health and wellness routine. Music is an effective and affordable way to improve emotional, cognitive and speech skills while maintaining physical and social ability. 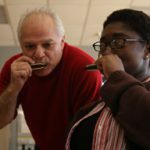 Give me a beat…and check out the 5 ways music therapy can improve the lives of seniors on the MomClick blog!